God is at work and we want to join Him! 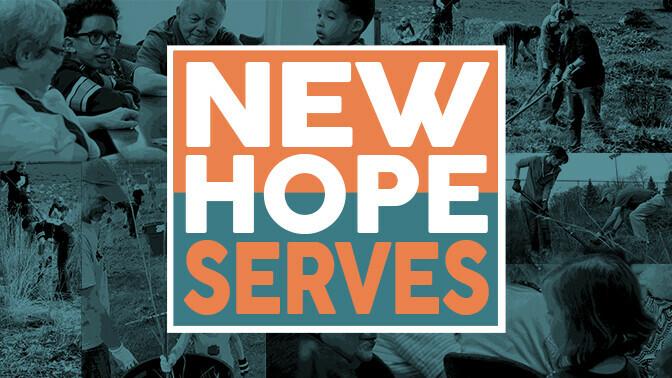 New Hope Serves is an opportunity for the entire church family to set aside a day to see what God is doing in our community. We're working alongside those who serve our community and are developing relationships with people who are often overlooked: the elderly, the disabled and the poor. You'll find a wide variety of projects taking place simultaneously throughout the day, each designed to strengthen our relationships as a church with strategic community leaders or community members. Prepare your heart to serve our community by worshipping God in prayer and song. All are welcome. No registration for the worship night. Register for one of these projects taking place on Saturday, May 4. Overview: Second Harvest Heartland is a food bank that finds solutions to connect the resources of our community with its hungry neighbors. We are working in their warehouse to sort and repackage food. Volunteers: 2–3 per shift. 8–12 total. Overview: Serve a catered dinner to Robbinsdale, New Hope and Crystal Police Departments and the West Metro Fire Department. This project is perfect for families with older elementary/middle school children. Volunteers: Maximum of 15. All ages welcome. Overview: At New Life Family Services, they believe each person should have the ability to receive physical, emotional and spiritual support as they face pregnancy-related situations and circumstances. This project involves several projects, including bundling diapers, sorting clothes, fundraiser preparation and other tasks. Volunteers: Maximum of 15. High school and older only. Overview: Robbinsdale Women’s Center provides lab-quality pregnancy tests with immediate results, consultation and ultrasound services to those making decisions about unintended pregnancies. We may work on interior painting, outside yard work and final remodel details. Overview: Meadow Lake is in the Robbinsdale School District. This is the fifth year we are assisting with weeding and restoring their rain garden. Location: 5430 Boone Ave N, New Hope, MN 55428. Activity Room. Volunteers: Maximum of 15. Family-friendly project. Overview: Engaging with the residents of the assisted and independent living apartments through music and board games. Volunteers: Maximum of 10–15. Family-friendly project. Overview: Ambassador is a rehab and outpatient therapy center that's part of the Good Samaritan Society network. Our group leads a devotional and hymn sing, following up with games and conversation with the residents. Overview: North Park Plaza is a low-income senior housing complex in New Hope that is a part of Volunteers of America. We are continuing to build relationships with the residents through hosting a tea party. This is a great opportunity if you're unable to take part in the May 4 event. Evermore Community provides monthly respite for adoptive and foster moms. It is a peaceful weekend to connect with others, relax and leave refreshed. Drop off donations for gift bags at the main campus reception desk. Suggested donations: coffee gift cards, nail polish, body lotion, bath bombs and salts, snacks (chocolate, granola and energy bars, including gluten free), devotional books, coffee mugs, tea, candles and essential oils.